Today I learned that apparently you can use beans to trick vampires. By some sort of leguminous magic, vampires are prone to mistaking beans for pregnant women (and possibly other kinds of humans). Who knew? This tidbit may or may not be related to my previous post about commodity items as media of exchange. Time will tell. Also, leguminous is an adjective meaning “relating to or denoting plants of the pea family” (including beans). I grew up on Bela Lugosi’s interpretation of Bram Stoker’s Dracula. For the longest time, that was what a vampire was—and it was the only thing a vampire could be! Vampires were suave, aristocratic, and spoke with an Eastern European accent. They turned into bats, drank the blood of their victims, slept in a coffin, and were destroyed by sunlight. In honor of Halloween, I thought I’d write a little about some of the unusual vampires or vampire-like creatures found in world mythology. These are not necessarily my “favorites,” but they perhaps show a little bit of the diversity of vampire lore. 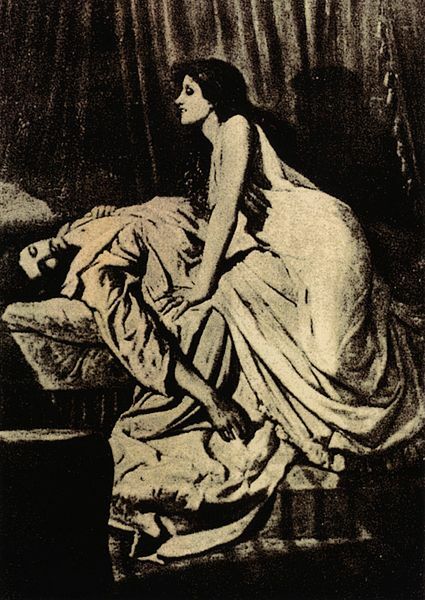 The estrie is a type of female vampire found in Jewish folklore. It is said to prey mainly on Jewish men, but it also has a taste for the blood of children. Estries are sometimes seen as comparable to succubi, seductive female demons. They are also shapeshifters, able to turn into birds or cats at will. The earliest estrie legends describe them as demonic entities. Later stories depict them living among mortals as part of the community, possibly victims of some sort of demonic possession. Unlike other demons or creatures of the night, estries are undeterred by holy symbols or holy places. This dwarf was a magician, and a dreadful tyrant, and after having perpetrated great cruelties on the people he was at last vanquished and slain by a neighbouring chieftain; some say by Fionn Mac Cumhail. He was buried in a standing posture, but the very next day he appeared in his old haunts, more cruel and vigorous than ever. And the chief slew him a second time and buried him as before, but again he escaped from the grave, and spread terror through the whole country. The chief then consulted a druid, and according to his directions, he slew the dwarf a third time, and buried him in the same place, with his head downwards; which subdued his magical power, so that he never again appeared on earth. The laght raised over the dwarf is still there, and you may hear the legend with much detail from the natives of the place, one of whom told it to me. In some versions of the tale, Abhartach rises from the grave to drink the blood of his former subjects. He is sometimes tauted as the (or an) inspiration for Bram Stoker’s Dracula. A vetala (also vetaal or baital) is a type of evil spirit from Indian folklore. They take possession of human or animal corpses to use as vehicles in which to hunt for blood to drink—although they are also able to move about without the aid of a material “host.” They can also possess living victims. The vetala is not simply an aspect or residue of person it inhabits. It doesn’t possess that person’s memories. They are malicious creatures in every way. In addition to their blood-drinking, cannibalistic tendencies, they are also known to kill children, cause miscarriages, and drive people insane. In at least one instance, however, these creatures are presented in a more positive light. In the story of Baital Pachisi, the vetala is a heroic character who saves the life of the king, the protagonist of the story. Vetalas can be repelled by chanting and released from their undead condition by performing the proper funeral rituals on their behalf. Ekimmu were the spirits of deceased humans who could not find peace in death. It was possible to become an ekimmu in a variety of ways including dying violently from murder, dying young, being improperly buried, etc. An ekimmu’s victims generally die after a few days. These creatures could also inflict disease or inspire criminal behavior. Although Yeats focused on the parasitic aspects of the leannán sídhe, others highlight her positive role as a muse.